Miscellaneous transactions are what Jennifer needs to begin with when she has to initiate material transactions. She has just completed defining the first subinventory at Office Smart Naperville (OSN). She needs to build some on-hand balance for items used at OSN. OSN currently has a stock of 50 units of LH101 in the Stores subinventory. In this section we follow Jennifer as she creates an initial stock of 50 units of the item LH101. We have introduced this item in the section on collection elements under Oracle Quality. 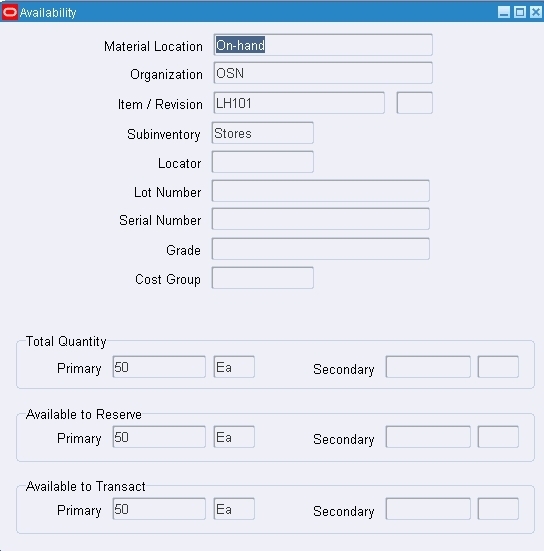 The simplest way to create an initial stockpile in Oracle Inventory is to perform Miscellaneous Receipts. Miscellaneous Receipts are an important tool used to receive material without a purchase order. Similarly, miscellaneous issues are used to give out material without approvals or a document number. Have You Tried The COMPLETE Video Guide to Implementing Oracle Inventory in R12? We have discussed the first two of these. An account receipt transaction is used to receive material against a general ledger account. Sometimes, you may use the account alias feature in Oracle Inventory to define names for commonly used accounts. These are called account aliases. When you receive material against an account alias you execute an account alias receipt. The same explanation extends to account issues and account alias issues. What are Miscellaneous Transactions used for? These transactions come handy for some specific situations. Let us follow Jennifer as she performs a miscellaneous receipt. Jennifer has to specify the type of transaction. She selects Miscellaneous receipt from a predefined list of transaction types. 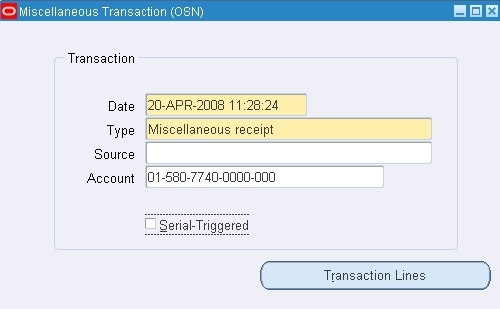 In the Source field, she has to enter the source type associated with the transaction type Miscellaneous receipt. Since no Source has been attached to the miscellaneous receipt transaction type, this field is left blank. But, the miscellaneous receipt (and in fact every miscellaneous transaction) needs to be charged to an account number. In case of miscellaneous receipt, this account will be credited for the dollar value of the material being received into the Stores subinventory of OSN. A point to remember here is that if Jennifer were required to enter miscellaneous receipts for multiple items or the same item being received into different subinventories (within the same inventory organization), then there may have been a need to enter different accounts against each transaction line. In that case one account would not be applicable to all. Then Jennifer would not have entered the account here. She would have entered accounts against the individual transaction lines. When Jennifer is entering the item and required quantity (50 Each) details, the screen shows her that the current available on-hand balance is zero. Once the transaction is saved, Jennifer navigates to the On-hand Quantity form and queries the Material Workbench. She wants to know if the on-hand balance has been updated. To her satisfaction, this is what she finds. So, the item LH101 now has an on-hand balance of 50 units. This completes the miscellaneous receipt transaction.